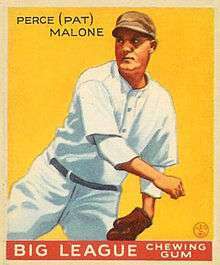 Perce Leigh Malone (September 25, 1902 – May 13, 1943) was a pitcher in Major League Baseball who played from 1928 through 1937 for the Chicago Cubs (1928–34) and New York Yankees (1935–37). Listed at 6 ft 0 in (1.83 m) and 200 pounds, Malone batted left-handed and threw right-handed. He was born in Altoona, Pennsylvania. Malone was outstanding in his first three Major League seasons. As a rookie, he compiled an 18–13 record for the third-place 1928 Chicago Cubs, striking out 155 opponents to finish second in the National League behind Dazzy Vance (200). As a sophomore, he led the NL pitchers with 22 wins, 166 strikeouts and six shutouts, helping the Cubs reach the 1929 World Series. He was the Cub starting pitcher for Games 2 and 5 of the '29 Series and also worked in relief in Game 4. Again in 1930, he led the league with 20 wins and finished in third place with 142 strikeouts, being surpassed only by Bill Hallahan (177) and Vance (173). He also tied Erv Brame for the lead in complete games, with 22. The next four years Malone lowered his previous numbers, averaging 14 wins and 104 strikeouts for each year. He won 15 games for Chicago as it won another pennant and made it to the 1932 World Series. His only appearance in that Series came after Cub starter Charlie Root surrendered back-to-back home runs to Babe Ruth and Lou Gehrig. At that point the Cubs brought in Malone, who threw 2.2 innings of scoreless relief, including a called third strike against Gehrig. Before the 1935 season, he was part of consecutive transactions between the Cubs, St. Louis Cardinals and New York Yankees. Moved to the bullpen by the Yankees, he collected 18 saves during three seasons, including an American League lead with nine saves in 1936. Malone won his only championship in the 1936 World Series. He recorded a save in Game 3 against the Giants, coming on in relief of Yankee starting pitcher Bump Hadley to nail down a 2-1 win. Malone was the hard-luck loser of Game 5. He worked four innings of one-hit relief, but the hit, a double by Bill Terry, came in the 10th inning and resulted in the Giants staving off elimination. It proved meaningless as the Yankees took Game 6 and the Series. In a 10-season career, Malone posted a 134–92 record with 1,024 strikeouts and a 3.74 ERA in 357 appearances, including 220 starts, 115 complete games, 15 shutouts, 26 saves, and 1,915.0 innings pitched. Malone was an alumnus of Juniata College and died in his hometown of Altoona at the age of 40. According to news reports, Malone, seemingly in perfect health, had a sudden attack of pancreatitis at his father's home in Hollidaysburg, Pennsylvania and was taken to an Altoona hospital, where he died.